This book is the most intense guide to creating professional ColdFusion applications available. Packed with example code, and written in a friendly, easy-to-read style, this book is just want you need if you are serious about ColdFusion. This book will give you clear, concise and, of course, practical guidance to take you from the basics of ColdFusion 8 to the skills that will make you a ColdFusion developer to be reckoned with. ColdFusion expert John Farrar will teach you about the basics of ColdFusion programming, application architecture, and object reuse, before showing you a range of topics including AJAX library integration, RESTful Web Services, PDF creation and manipulation, and dynamically generated presentation files that will make you the toast of your ColdFusion developer town. This book digs deep with the basics, with real-world examples of the how and whys, to get more done faster with ColdFusion 8. 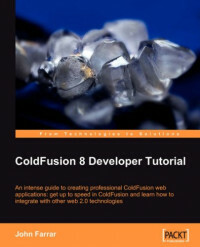 This book also covers the new features of ColdFusion 8 Update 1.